I have been waiting for the day I could turn this quilt and obscure the “ugly” interior layer. Today is the day and guess what – I’m feeling reluctant. 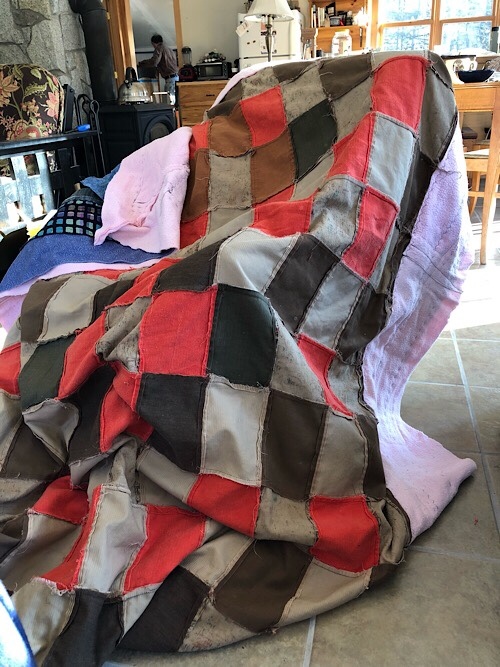 So I spent some time with the threadbare corduroy patchwork, trimming the ancient unravelings bunching up at the corners. I trimmed raveling corduroy threads and also brown machine stitching holding the squares together. I’m quite sure I touched thread that my mom touched when putting this together years ago. Almost 50 years ago? This photo is so I know it’s there.